Red cabbage seems to work wonderfully with duck. We have used this recipe (sometimes with slices of peeled granny smith apple through the cabbage) with duck breasts for Christmas dinner. 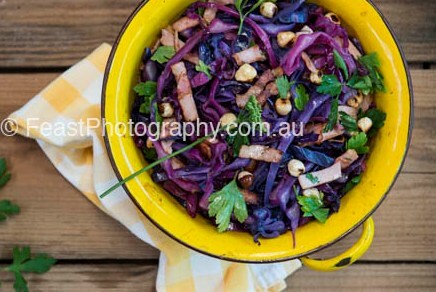 It is ridiculously easy but adds wonderful colour to any plate! Roast and skin the hazelnuts. Heat a heavy-based saucepan over medium heat and add a little olive oil. Add onion and garlic and sweat until onion is transparent. Add cabbage to pan and sauté until softened. Add vinegar and brown sugar, mix lightly, cover and cook for 10 minutes. Remove lid and cook for a further 5 minutes. Just before serving, fold in parsley, then top with crisp bacon and scatter with hazelnuts. *To crisp the bacon, place in a single layer under the griller and grill until crisp. Drain on absorbent paper.